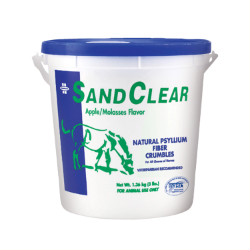 Helps to reduce the risk of sand colic. Contains psyllium seed husk. Recommended by veterinarians, psyllium absorbs water in the intestines to form a gel-like substance which increases bulk, softens stools, and helps remove sand from the ventral colon. Highly palatable apple and molasses flavored crumbles. For horses of all ages, including young foals.